Haiti (MNN) — A short-term missions team from Bauer Community Fellowship in West Michigan is beginning their work in La Gonave, Haiti. Freddy Williams, the go-to-guy for Starfysh work teams, met the Bauer team in Port-au-Prince. Williams has been working with Starfysh since its inception in 2010, and has 40 years of missionary experience in Haiti. Haiti is full of challenges as the poorest country in the Western hemisphere: extreme poverty, constant natural disasters, no infrastructure–to name a few. But some rise above the rest on La Gonave. The only way to describe La Gonave’s so-called roads is to imagine the roughest trail you’ve ever walked. Increase the jaggedness of that terrain by ten, and you might come close to describing the island’s pathways. Transportation doesn’t just pose a challenge to ministry: it’s an obstacle to the people of La Gonave, as well. Most walk miles to access somewhat-clean water, a problem Starfysh is alleviating through the distribution of water filters. “Dealing with the culture itself sometimes is a problem,” Williams adds. “You have a break-down in communication because of the language and the culture. As daunting as La Gonave’s challenges can be, the rewards of ministry labor are even greater. Williams says improving livelihoods and building people up are central to the work of Starfysh. One of those principles is getting priorities straight, Williams explains. Starfysh works side-by-side with the Wesleyan church. Haitians receive the Gospel message of salvation at church and are discipled when they go to work for Starfysh. This is where transportation challenges are a blessing in disguise. “We’re here living the Gospel right before them,” says Williams. “We’ll be riding to some location, and I’ve got a captive audience; they can’t help but listen to me. Work teams add another layer to the “living Gospel.” Today, the Bauer team is meeting physical needs through a mobile dental clinic. Some members of the team are spending time with the next generation, planting seeds of encouragement and hope through the help of translators. Part of the biggest value teams provide comes when teams head home. “We couldn’t purchase that type of advertising that you’re going to give to us when you go back and show your pictures to your friends, and put it on Facebook and Twitter, and all those sorts of things,” says Williams. 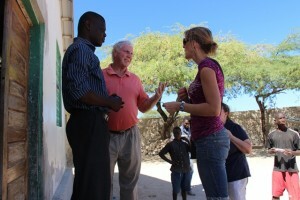 Click here to contact Starfysh and join the next team headed to La Gonave. Pray for the Bauer team as they continue living the Gospel in La Gonave this week. You can also pray for rain; Haiti is in its dry season, and La Gonave hasn’t seen rain for three months. Pray for safe travels for the Bauer team. Pray for the people of La Gonave.